Stadium comes first, and then comes the team. 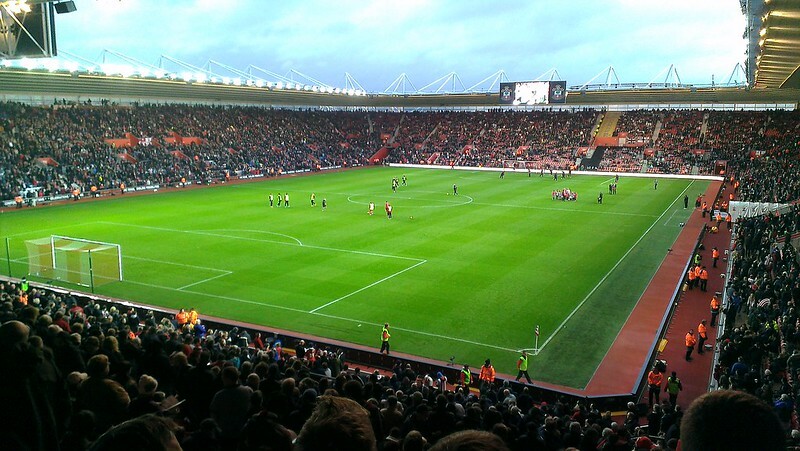 Built in 2001, St. Mary’s Stadium has turned into a legendary battlefield hosting Southampton F.C. The stadium depicts the club’s glorious history and is the home of 32,384 of its dedicated supporters. The year 2001 witnessed a historical event. Southampton FC which had played at the Dell for 103 years, moved to a brand new ground. Today it’s known as St. Mary’s Stadium. The fun part is that the club’s original name was St Marys Young Men’s Association since it was founded at St. Mary’s Church. Therefore, in a certain sense, Southampton FC returned to its roots. This lovely stadium’s construction took place from 1999 to 2001. It is a completely enclosed football ground featuring the longside Kingsland and Itchen stands and the shortside Chapel and Northam stands. The corner areas are called Itchen South, Itchen North, Kingsland North, and Family Stand. The seats for the away fans are located at the Northam stand and Itchen North. Chapel and Northam stands located behind the nets. All stands, excluding the Itchen stand, can be expanded in future increasing the stadium’s capacity to 50,000 seats in total. However, those plans are currently shelved because the tickets at St. Mary’s Stadium sell out not so often at the moment. In general, buying tickets for the home matches of Southampton F.C. is quite hassle-free. On average, the stadium has 1,500 empty seats during the Premier League matches but the best seats always sell out quickly. StubHub is a timesaving solution which can help you to get the best seats at St. Mary’s Stadium at a reasonable price. The service boasts with an intuitive interface, advanced navigation, international delivery, and a number of other great features. In the ticket office located right at St. Mary’s Stadium. The ticket pricing at St. Mary’s Stadium is categorized like at the majority of the English stadiums. The tickets for the most anticipated matches are pricier and belong to the category A. The rest of the fixtures are known as category B matches and those tickets cost less. The prices usually range from £30 to £52. Although I’m not a Sotonian myself it’s clear to me why the local people are so proud of their home city. There are many things that lure tourists to Southampton. Of course, football spectacles are among them. But no matter what’s your primary reason to visit the city of Titanic, Craig David, and Mayflower Theatre, Booking.com is your best assistant in finding the most amazing hotel deals. Below you’ll find a few tips and hopefully, you’ll book the accommodations of your dreams in Southampton. The Swan Inn – is located within a 6-minute drive from St. Mary’s Stadium. If you are looking for budget accommodations in Southampton, this £46-deal can please you. This inn has been recently refurbished so it’s clean and pretty cosy. The Winston Hotel – the distance from this hotel to Southampton’s football stadium is about 2 miles. It’s a pleasant place to stay for £59 per night. They have got a good on-site restaurant with very affordable food. Also, the menu is quite impressive. The Juniper Berry – is a welcoming place with a wonderful English pub onsite. The rooms are spacious, clean, and warm even during the coldest weather. At £60 per night, this hotel is a lucky find. room2 Southampton – is within walking distance from St. Mary’s Stadium, if you don’t mind a 20-minute walk. It’s a superb place to stay in Southampton if you plan to visit its main attractions. The price per night is £107. THE PIG-in the wall – the distance from this authentic hotel to the football ground of the Saints is 1.2 miles. It’s a perfect opportunity to spend a wonderful night in the heart of the city with unique homelike ambience. The hotel charges £140 per room. Southampton Harbour Hotel & Spa – the rooms of this hotel are overlooking the fascinating harbour and have an impressive list of top-class amenities available for the guests. Unsurprisingly, the price of the room per night is £225. It’s a 15-minute walk to St. Mary’s Stadium. Ennios Boutique Hotel – is simply an amazing place which will forever stay in your heart. Everything about this hotel is fantastic. At £123 per night, it’s actually almost a crime not to check out this place before booking anything else in Southampton. It’s located just over a mile from the stadium. Southampton is not a huge cosmopolitan centre. Therefore, getting around this city is quite easy and convenient. The stadium of the Saints is situated just east of Southampton’s central part near the docks. It’s close enough to the main shopping hubs and places of interest. For example, it is 20 minutes walking from Westquay Shopping Centre and 13 minutes walking from Solent Sky Museum. By Bus – the bus lines Bluestar 7, 16, 18, and City Red X4 and X5 are relevant alternatives that may be used to reach St. Mary’s Stadium. By Shuttle – this service functions only on matchdays starting 2.5 hours before the kick-off. The shuttles depart from the Town Quay Ferry Terminal and Southampton Central railway station. By Car – Britannia Rd, Southampton, England SO14 5FP is St. Mary’s Stadium’s address. The roads around the ground are closed on gamedays. Use a smartphone and Google Maps to get the optimal directions. By Train – the walk from Southampton Central railway station to the stadium takes half an hour. Of course, you can always take the bus Bluestar 18 or 7 to reach the ground more conveniently and faster. The bus ride and a short walk take about 20 minutes. By Plane – Southampton Airport (SOU) is located only 4 miles from St. Mary’s Stadium. You can always take a cab or Uber for such a short ride but if you want to use public transport, consider taking a train to Southampton Central. They depart every 10 minutes and from there you can take the bus Bluestar 18 or 7. Street parking options near the Saints’ football ground are limited. However, there is always a solution. The approximate matchday paid parking price near the sports venue in Southampton is £4-5. Southampton is also known as Europe’s cruise capital. Surely, the place with such a self-explanatory nickname should have a huge variety of foodie pit stops to satisfy each of four million tourists. That’s exactly the number of visitors Southampton attracts yearly. Below you’ll find top places to eat within walking distance from St. Mary’s Stadium. Dancing Man Brewery – is around a 25-minute walk away from the ground. The enigmatic medieval stone building will impress you with its interior and the amazing pies. They have twenty beers and real ales in rotation with seven on tap at any day. Grand Café – is a 15 mins’ walk from the stadium and it’s probably one of the best bars on England’s south coast. There are many great things about this venue. No matter whether you like fillet steak, roast dinner, cupcake, pudding, or just want to sip a cocktail, you will love the time spent there. The Duke of Wellington – is a cosy classic pub which can be found in the heart of the city. Impressively, it’s been a public house since 1494 and even today they still serve home cooked meals like they did over 500 years ago. Bacaro – is a cosy restaurant with some delicious Mediterranean and Italian meal options. Their menu is not based on pizza and pasta like in many other similar places. It’s more extravagant and most importantly, healthy. Blue Island – is located 1 mile from St. Mary’s Stadium. It features traditional Greek and English menu which will make you long for more. The place is run by a very welcoming owner which adds an authentic feel to the overall atmosphere. Everest Cuisine – features fabulous Nepali and Indian dishes with plenty of vegetarian options, fancy spices, and an impressive number of starters. It’s also situated just 1 mile away from the ground. The club’s stadium is a relatively new and very atmospheric venue. It offers great stadium tours at the most reasonable price. Unfortunately, Southampton F.C. has not got a museum. However, there is an excellent fan store at the ground. The guided tour is an affordable and fun way to learn more about the club’s and football venue’s history. It also provides exclusive access to areas of the stadium which are normally unavailable for the football fans. Among such areas are the warm-up room, dressing room, and even the players’ tunnel. While the adult ticket costs £12 and concessions ticket costs £6, it’s possible to save a few pounds by purchasing a family ticket or use Saints season ticket to get a 50% discount. You can find Saints Megastore directly at the football ground. However, if you are in Downtown, simply head to Westquay Shopping Centre and find The Saints Store. Lastly, you can always go online and order Southampton F.C. official merchandise here. The city is known for its cruises, museums, parks, shopping centres, and certainly football club. Exploring the south coast of England you’ll find tons of thrilling things to do and to see. But below I’ll give you a few valuable tips to make sure you won’t miss the most exciting stuff while you are exploring Southampton and its neighbourhoods. Hop-on bus tours are currently unavailable in Southampton. Although the city is relatively spacious and spread out, the Old Town is compact. You’ll find it easy and fun to walk around its most spectacular areas, wander around the green parks, and go shopping at the major regional malls and boutiques. Qualified city guides will gladly take you on a tour of the city’s medieval walls. At the Bargate, you can take a maritime waterfront tour which is also very amusing. Numerous boat tours such as Blue Funnel Cruises provide alternative opportunities to explore Southampton and the South Coast region. They feature 1-hour tours, full-day trips, and everything in between. Solent Sky Museum – is the venue showcasing the history of local aviation. The aircraft development work which took place from the early 1900s to 1960s in Southampton’s area played an important role in world aviation history. The collection presented in this museum is also absolutely stunning. Steamship Shieldhall – provides a one-of-a-kind experience in Southampton. Imagine yourself at the largest working steam ship in Great Britain! And wait for this – you can actually reserve it for a private birthday party, for example, and enjoy live jazz band, amazing food, and a well-stocked bar. If you don’t need a private tour, you can still enjoy this unforgettable steaming adventure with the other 200 passengers. Stonehenge – is located only 33 miles away from Southampton. There are many ways how you can get from Southampton to Stonehenge including pre-cruise tours, bus excursions, and car rental option. The admission fee is quite expensive – £17.50. But this iconic place is well worth it.